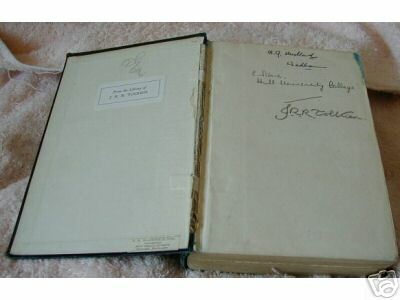 TOLKIEN PREVIOUS OWNED BOOK EXTREMELY RARE, ONE OF A KIND. THE TITLE OF THE BOOK IS SPECIMENS OF EARLY ENGLISH. FIRST PUBLISHED 1886 THIS IS THE SECOND EDITION 1935. 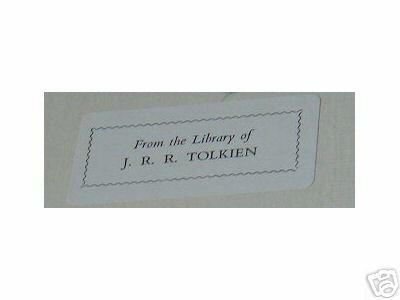 THE PREVIOUS OWNER OF THE BOOK WAS J R R TOLKIEN, IT IS SIGNED BY HIM ON THE FRONT PAGE AND HAS THE "FROM THE LIBRARY OF J. R. R. TOLKIEN" STICKER ON THE INSIDE FRONT COVER. 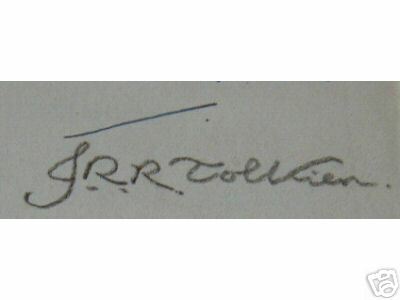 THE BOOK HAS BEEN ANNOTATED THROUGH OUT, I AM NOT SAYING BY TOLKIEN, BUT THEN YOU WONDER WHO ELSE BY? ITEMS OF THIS IMPORTANCE VERY RARELY COME ON THE OPEN MARKET, THEY ARE USUALLY SOLD TO PRIVATE COLLECTORS OR MUSEUMS.